The climate of Hangzhou (or Hangchow) is temperate, with relatively cold winters, and hot, muggy and rainy summers. 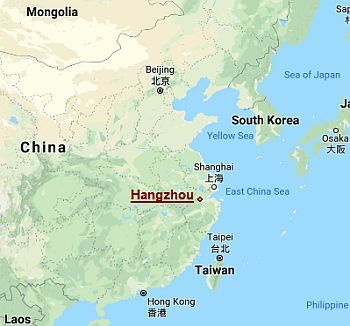 Hangzhou is a megalopolis located in eastern China, in the Zhejiang Province, at the mouth of the Qiantang River, which then opens in Hangzhou Bay. 150 km (95 mi) north-east of the city we find Shanghai, while to the northwest, we find Nanjing. Precipitation is quite abundant, and amounts to 1,400 millimeters (57 inches) per year; there is no real dry season, however, rainfall drops below 100 mm (4 in) per month from October to February. Summer, when the rains occur mainly in the form of showers or thunderstorms, is the rainiest season. Here is the average rainfall. Winter, from December to February, is quite cold: the average January temperature is 5 °C (41 °F). There can be cold periods, with highs around 5 °C (41 °F) or below, during which even snow may fall. In January 2016, the temperature dropped to -8 °C (17.5 °F). In constrast, in other periods, the temperatures are mild, around 15 °C (59 °F). Sunny days are a bit more frequent in December, then they become rarer. At night, fog can form. Spring, from March to May, is initially mild, and then becomes gradually warmer. In May, there are already some hot, summer-like days. Summer, from June to September, is hot and muggy. The heat island effect of the big city and the humidity from the sea make the heat uncomfortable, especially in July and August. June is the rainiest month of the year. Periods of good weather can be sweltering, especially in July and August, with highs around 37/38 °C (99/100 °F) or higher, and tropical nights. In August 2013 and in July 2017, 41 °C (106 °F) were recorded. Autumn, in October and November, is initially mild, and gradually becomes cooler, and then quite cold at night by November. Rainfall is moderate. The amount of sunshine in Hangzhou is not very good; however, it is decent in July and August, while it is poorer from January to March. Near Hangzhou, the sea (East China Sea), cold in winter, becomes warm enough for swimming from July to September; in June and October, it is a bit cool, but basically acceptable. From time to time, from June to early November, typhoons, the tropical cyclones of Southeast Asia, can affect this area, though less so than in southern China. 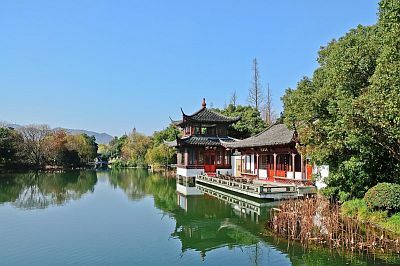 It is not easy to find the best time to visit Hangzhou. As the spring is more rainy, you can choose autumn, especially from the end of September to the beginning of November, which is generally a mild or pleasantly warm period; it must be said that the arrival of a typhoon can not be excluded.